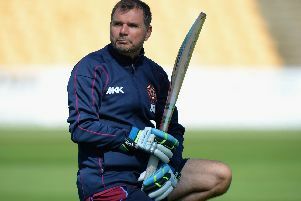 Mick Newell says he and his players have ‘massive’ respect for the Steelbacks ahead of their NatWest T20 Blast semi-final at Edgbaston on Saturday. And the Notts Outlaws director of cricket isn’t sure Northants are worthy of the underdog tag they revel in. Newell and his Notts team will be favourites to turn the Steelbacks over in their last four clash, but that is more down to the fact they have won nine T20 matches on the spin and are the country’s form team rather than any chink in the Northants armoury. Notts were comfortable winners over the Steelbacks in their North Group match at the County Ground last month, and although Newell is confident ahead of finals day, he knows his team will be in for a test against Alex Wakely’s men, who won the tournament in 2013, and were beaten finalists in 2015. “It’ll be a big day and we’re looking forward to it,” said Newell. “Northants have played some fantastic white ball cricket. “If you keep getting to quarter and semi-finals like they do then I’m not sure how much longer you can say they’re the underdogs. “We respect them massively. It’s very difficult to win a trophy and we want people who are coming to enjoy it. We want people who are watching on the television to enjoy it. While Northants sweat on the fitness of key players such as Richard Gleeson and Steven Crook, Notts have no such worries. Not only do they welcome back England pair Alex Hales and Stuart Broad to their ranks, West Indies star all-rounder Andre Russell is also available after finishing his stint in the Caribbean Premier League, where he helped Jamaica Tallawahs claim the title. Russell’s arrival means Notts have three overseas players in their squad, and one of them will have to miss out as only two are allowed to play. With Australian Dan Christian the Outlaws skipper, the most likely make way for Russell against Northants is South African spinner Imran Tahir, and that won’t upset Northants head coach David Ripley too much as Tahir was one of the star men in the Outlaws’ group win over the County, claiming three for 13. Newell insists a decision on the team to face Northants won’t be made until the toss.